Equal parts fun and function, this gorgeous bed will make bed time a bit more exciting for the kiddos! A fabulous Handmade Holiday gift that will keep on giving for years after you build this! 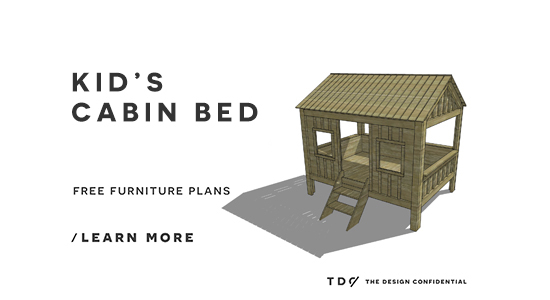 If you prefer plans for the Twin Sized Cabin Bed or the Toddler Sized Cabin Bed, we got you covered! 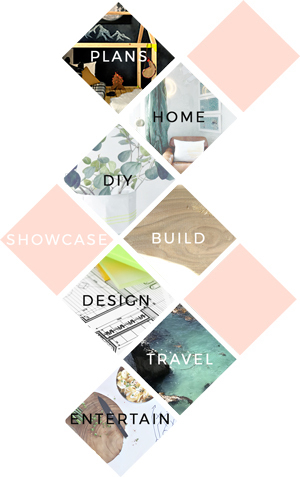 // Refer to specific steps in this plan before cutting pieces – some pieces are cut with angled ends and their exact measurements may differ from the measurements listed below. Measurements listed below are PRE-BEVEL dimensions and the actual end measurements will change once cut according to specific steps. / Click on Images to expand. If a plan has images that are too hard to read, please let me know and I will reupload the images for easier reference. Cut the pieces for Posts A and Posts B as shown. Set the Kreg jig for 1-1/2” material. Drill pocket holes in the long side of Post A as shown. Assemble Post A to Post B as shown with glue and 2-1/2” pocket screws. Repeat this process again, but in a “mirrored” assembly as shown in the image. Built a total of two sets of these “mirrored” Post pairs. Cut the pieces for the Side Top Rail, Side Middle Rail, and Side Bottom Rail. Drill pocket holes in the ends of all pieces. Assemble pieces as shown with glue and 2-1/2” pocket screws. Cut the pieces for the Back Top Rail, Back Middle Rail, and Back Bottom Rail. Drill pocket holes in the ends of all pieces. Assemble as shown with glue and 2-1/2” pocket screws. Cut the pieces for the Front Top Rail and Front Bottom Rail. Drill pocket holes in the ends of both pieces. Assemble as shown with glue and 2-1/2” pocket screws. Cut the pieces for the Rafters. Drill pocket holes in the ends of the pieces (avoid drilling pocket screws in the Ridge notch area). Assemble as shown with glue and 2-1/2” pocket screws. Cut the pieces for the Floor Joists. Drill pocket holes in each end of the pieces. Assemble as shown with glue and 2-1/2” pocket screws. Cut the piece for the Back Wall. Assemble as shown with glue and 1-1/4” brad nails. Set the Kreg jig for 3/4” material and drill pocket holes on the bottom of the Back Wall piece. Assemble as shown with glue – use 1-1/4” brad nails to secure the top and sides and 1-1/4” pocket screws to secure the bottom sides. Cut the pieces for the Front Wall. Drill pocket holes on the bottoms of the Front Wall pieces. Assemble as shown with glue – use 1-1/4” brad nails to secure the top and sides and 1-1/4” pocket screws to secure the bottom sides. Cut the pieces for the Side Bottom Walls. Assemble as shown with glue and 1-1/4” brad nails. Drill pocket holes on the bottoms of the Side Wall pieces. Assemble as shown with glue – use 1-1/4” brad nails to secure the top and sides and 1-1/4” pocket screws to secure the bottom sides. Cut the pieces for the Side Top Walls. Assemble as shown with glue and 1-1/4” brad nails. Cut the pieces for the Front Trim, Door Trim, Window Trim, and Stair Hanger. Assemble the Front Trim, Door Trim, and Window Trim as shown with glue and 1-1/4” brad nails. Drill pocket holes in the ends of the Stair Hanger and attach with glue and 1-1/4” pocket screws. Cut the pieces for the Side Bottom Trim and Side Bottom Ledges. Attach as shown with glue and 1-1/4” brad nails. Cut the pieces for the Side Top Trim. Attach as shown with glue and 1-1/4” brad nails. Cut the pieces for the Back Trim and Back Ledge. Attach as shown with glue and 1-1/4” brad nails. Cut the pieces for the Purlins. Attach as shown with glue and 1-1/4” brad nails. The ends of the Purlins should extend 1-1/4” past the Rafters. Cut the pieces for the Roof Slats. Attach as shown with glue and 1-1/4” brad nails. Roof Slats should be spaced 1/2” apart from each other and extend approximately 2” past the Front and Back Rails. The first and last Roof Slats should be flush with the Roof Ridge. Drill pocket holes in the both ends of the steps. Assemble as shown with glue and 1-1/4” pocket screws – make sure the pocket holes face the ground when assembling. Place on the Stair Hanger as shown and climb on in!